The ultimate guide to exploring WA’s top swimming holes. Always wanted to hit the road and explore WA’s top swimming hole locations? Our guide will show you how to get to the stunning swimming hole locations and where best to stay nearby for the ultimate swimming hole adventure. Situated on the banks of the Collie River, Honeymoon Pool is literally surrounded by bushland as it reaches right up to the edge to meet the water, providing a truly unique swimming hole experience. Keen to do more than swim? Steps at the `day use` area provide access to the river for campers and other visitors to launch canoes, kayaks and stand up paddle boards. There are also a variety of walk and cycle trails in the Wellington National Park, including the long-distance Munda Biddi cycle trail which is fast becoming a world-class nature based off-road cycling experience. Located on the banks of the Collie River, the campground has 20 individual sites for tents and small campervans. Wood barbecues and picnic tables are available to guest as well as gas barbecues. Cost: $10 per adult per night. While you can cool off with a dip in the calm clear waters of Lake Navarino, the lake is also popular for recreational water activities such as water skiing and freshwater fishing. Bring your family and friends down for a weekend of water adventure and camping, with numerous accommodation options on site. Lake Navarino has all your accommodation needs covered from lake-side camping to glamping and cabins. Lakeside camping has become a favourite with many visitors as it provides a real back to nature experience, allowing you to fall asleep to the sounds of the lake and rise as the birds chirp. Cost: from $10 per adult and $5 per child per night for lake-side camping. Who’s up for a spa? At end of Wyadup Road, Yallingup there is a place where you can truly relax. The waves from behind the rock pool create jet like water pressure, as the water flows down the rock face, resulting in a spa-like experience. Yallingup Beach Holiday Park is the perfect place to stay while you explore the Natural Spa and the southwest. The holiday park contains cabin, caravan park and camping accommodation with toilet and shower amenities. If you want to make your stay is a little more luxurious, why not glamp on site. With several glamping options available direct through specialist glamping businesses you won’t be short on options. For more information on glamping visit Top Glamping Spots in WA. Cost: Camping from $10, cabins from $90. Fees range in pricing – please see link below. On a clear and sunny day, Black Diamond truly sparkles and radiates a magnificent blue colour, making it some of the bluest water you will ever see. The lake is perfect for a dip, stand up paddle boards, canoeing and kayaking. Some visitors like to bring inflatable floats and lay back and enjoy the beauty of the lake and its surroundings. Collie River Valley Tourist Park is an ideal hub for this exciting part of the South West. The park features a spacious campsite and caravan facilities as well as cabins for those who require a few more creator comforts. Cost: From $30 per night for 2 adults. Swim, jump or float at Barrabup Pool as you are surrounded by Nannup bushland. The native trees provide plenty of shade for those hot summer days and the calm waters of the pool and sounds of the bush make it one of the most relaxing swimming holes in Western Australia. Just as a heads up the pool can get ‘quite cool’ due to the shade of the trees. Want to explore more than just the swimming hole? Hike or cycle the Old Timberline Trail from Nannup to Cambray Siding (20km one way) or hike or cycle in to the Sleeper Hewer’s Hut on the Old Timberline Trail and camp overnight. 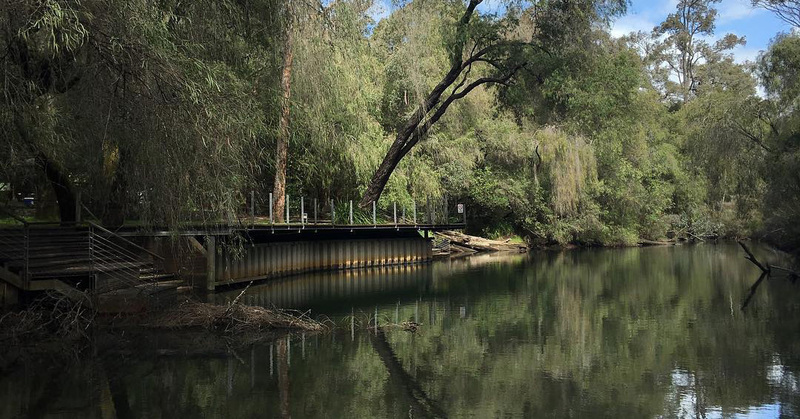 St Johns Brook Conservation Park is a favourite with locals and visitors for swimming, picnics and camping. The park also has a fascinating saw-milling history from early last century that is still evident today around Barrabup Pool and along the Old Timberline Trail. Facilities include tables, fire rings, sealed vault pit toilets and information. Serpentine Falls is located only 1 hour from Perth – making it the ideal road trip to check out one of WA’s most popular swimming hole locations, but why not make an extended trip out of it. At Serpentine Falls you can enjoy the rock pool with waterfall flowing down from the 15m granite rock face, but there is also much more to see and do away from the swimming hole. Put your sneakers on and hike Baldwin’s Bluff Nature Track (6km) or the Kitty’s Gorge Walk Track (14km return), both of which will take a good portion of the day as you take in the stunning surrounds and jarrah forests. Full list of local attractions. Serpentine Falls Park Home situated only minutes from the falls offers a range of accommodation options catering for all budgets – including powered caravan sites, holiday homes and cabins. Cost: From $40 per night (powered caravan site) and $80 (standard cabin). At Moore River, you can enjoy the best of both worlds; river and sea. The mouth of the Moore River is a popular place for kids to swim with the natural sandbar providing visitors with calm waters, which also makes it a paddler’s dream. So, make sure to bring your stand up paddle boards, kayak and or canoe. As Guilderton is only a short drive north of Perth it is the perfect spot for a no fuss and enjoyable weekend away. The only way you could get closer to Moore River or the beach would be sleeping on top of the water! Guilderton Caravan Park provides accommodation with riverfront views, just metres from the beach. Guilderton Caravan Park provides camping and caravan sites as well as self-contained chalets. Cost: Caravan and camping sites from $28 per night, chalets from $130 per night. Why go to the beach when you go can to Herron Point? Herron Point is situated along the white sandy shoreline of the Harvey Estuary and provides guests with a getaway experience just over 1 hour from Perth and mere minutes from Mandurah’s town centre. Swim and chill, take the boat for a cruise or simply sit back, relax and take in a stunning sunset. Herron Point Campground is a nature based camp offering families, travellers, locals and even pets a relaxing place to camp. Cost: $7.50 a night per person over 16+. North Dandalup Dam is located within the Peel region and near other swimming holes – Serpentine Falls (25mins), Herron Point (30mins) and Lane Pool Reserve (45mins). The recreation lake formed from the former Pipehead Dam is an ideal place for relaxed water-based activities including swimming, stand up paddle boards and floats. Don’t forget to pack the picnic basket as the grassed areas next to the lake will see you throwing down a blanket and enjoy the day out in the fresh air. Located just over 30 minutes away from North Dandalup Dam, Herron Point Campground is the perfect spot to not only take in Herron Point but also explore the rest of the Peel region. If you are looking for something perhaps alittle closer try Dwellingup (Marrinup or the Caravan Park) or in Pinjarra (Pinjarrah Holiday Park). The perfect place for a weekend getaway! Lane Poole Reserve is ideal for a relaxing dip in the tranquil waters of the Murray River, or if you are feeling more adventurous jump on your stand up paddle boards. Also popular with visitors is the 11.5-kilometre canoeing journey from Yarragil to Nanga Road Bridge. Lane Poole Reserve is very popular for camping with many different camping areas. Camping in the more secluded campgrounds Baden Powell, Charlies Flat, Chuditch, Stringers, Tonys Bend and Yarragil must be booked online. Larger campgrounds at Nanga and Nanga Mill are suitable for groups, these cannot be booked in advance – operating on first come, first served. Cost: Fees apply please see the link below. A former railway dam turned recreational lake, Lake Leschenaultia is now a beautiful place with peaceful surroundings to take a quiet dip and best of all it is only 1 hour east of Perth. Get your mates together or load the family in the car and visit Lake Leschenaultia which also has numerous other attractions to keep you busy including picnics/camping, bushwalking and canoeing. Facilities provided at Lake Leschenaultia Camp Site include a café, kiosk, toilets, playground, barbecues, picnic areas, grassed areas, camp kitchen and walking and cycling trails – making Lake Leschenaultia a must for a quick weekend getaway. Cost: $20 site fee, from $9.50 per person per night. Not only can you swim in the crystal clear, fresh water of the lake it is also a perfect place to canoe, stand up paddle boards or just float along on your giant white swan float. Lake Brockman has also become a premium location for water skiing and wakeboarding. Take in the night sky at Lake Brockman with numerous camping facilities, a brand new playground and accommodation. Want to spruce up your visit? Organise a glamping experience with one of many WA glamping specialists. Cost: Campsites from $30 per night (2 adults). Now we start to get a bit further away from Perth. Welcome to Mother Nature’s playground. Hands down Karijini National Park is home to the best swimming holes in WA – perhaps in Australia! However, it will take a bit longer to get to than the other swimming holes. Over 16 hours to be exact. Karijini National Park is what dreams are made of surrounded by the Western Australia outback and engulfed by rocks that are millions of years old. Not only will you be amazed by the swimming holes, there are numerous bush walking trails that will allow you to explore the outback and take in breath-taking scenery from different vantage points. Enjoy the peaceful surrounds of the outback at Dales Gorge Camping Ground – a great place to also explore the eastern end of Karijini National Park. While you may be out in the wilderness the campsite has bush toilets, picnic tables and gas barbecues – making it an ideal place stay for a few days. A little further away than the swimming pools down south, Python Pool is situated just over 2 hours from Karratha, nestled into the Chichester Range at the base of a seasonal waterfall. Python Pool has become a popular, deep swimming hole amidst the stunning rock formations and offers visitors nearby walking trails, to take in a truly unique outback experience. Time from Perth: 17 hours 45mins by car or you could fly to Karratha and then it’s only a 2 hours and 30mins from Karratha town centre. Miliyanha Campground is set in bush lands close to the Millstream Creek and pools that attract wildlife. Facilities on site include toilets, a camp kitchen with gas barbecue and hot water adjacent to Millstream Homestead. Cost: From $10 per night per person. Ellendale Pool is a stunning waterhole naturally formed along the picturesque Greenough River, located 40 minutes east of Geraldton near the historic town of Greenough. Take a dip or a float in the refreshing water then sit back and soak up the striking beauty Mother Nature has to offer. This is your weekend escape just waiting for you. Enjoy some time with nature while only 40 minutes from Geraldton. Ellendale Pool Camping site has toilets, barbecues, plenty of undercover seating and even a kids playground. Cost: Small campsite fees ($5) payable to Geraldton Visitor Centre. El Questro is 700,000 acres of vast and stunningly beautiful terrain – extending 80 km north to south and 60 km east to west and is mostly unexplored. We do however know the location of a stunning natural spring that is a must for any exploring the Kimberley region. This natural oasis is a short walk along a trail, which leads you through dense Kimberley palms to a series of rocky thermal pools. Set at the base of sheer cliffs these thermal springs are the perfect place to relax and restore amongst the region’s local vegetation. Please note that Zebedee Springs is closed in the afternoon so plan your morning around a visit to the Springs so you don’t miss out on this most popular of attractions in the El Questro region. Once you have gone for a dip at the Zebedee Springs the adventure doesn’t stop there. El Questro has a host of activities including walking trails, 4WD, fishing, helicopters tours and much more. This is truly the perfect place to experience the true WA. The Black Cockatoo Campground is the best place to setup camp when exploring the El Questro region. The campground is equipped with newly designed shower blocks and camp kitchens with BBQ’s and laundries, however, that is not the best part. Black Cockatoo Campground is also located close to the Steakhouse Restaurant, Swinging Arm Bar and Grill and the general store. Enjoy one of WA’s finest watering holes followed by a night on the town… well campsite. Cost: Camping sites starting from $20 per adult per night, $60 per family per night. Where the desert meets the sea, or should we say, ‘little lagoon’. For the slightly more adventurous traveller, Little Lagoon is approximately 8.5 hours drive from Perth, but situated only 5 minutes outside of Denham. The beautiful calm waters make for the perfect relaxing swim or float in your very own lagoon. Or simply just lay by the lagoon and watch the day go by as the sun sets over the ocean. Denham Seaside Tourist Village is located right on the beach (as seen in the video above) and is the perfect place to stay for those looking for a beach filled getaway. A bonus to visiting Little Lagoon and staying in Denham is you can also visit the dolphins at Monkey Mia – giving you an up-close experience with local bottlenose dolphins. Cost: Camping sites starting from $33, Caravan sites from $39.50, Cabins from $85 and Villas from $135 per night. There are so many Things to Do in Perth, luckily we have this latest guide to help.